This special event is the first in a line of concerts at the newly developed outdoor venue being featured at the MOXIE Cafe in Santa Maria. Enjoy a beautiful late summer afternoon with music, dancing, delicious food, local brews from Firestone, assortment of wine from Presquille and Kenneth Volk Vineyards! Gates open at 3PM, Music starts at 4! No pets allowed. No outside food or beverages allowed. 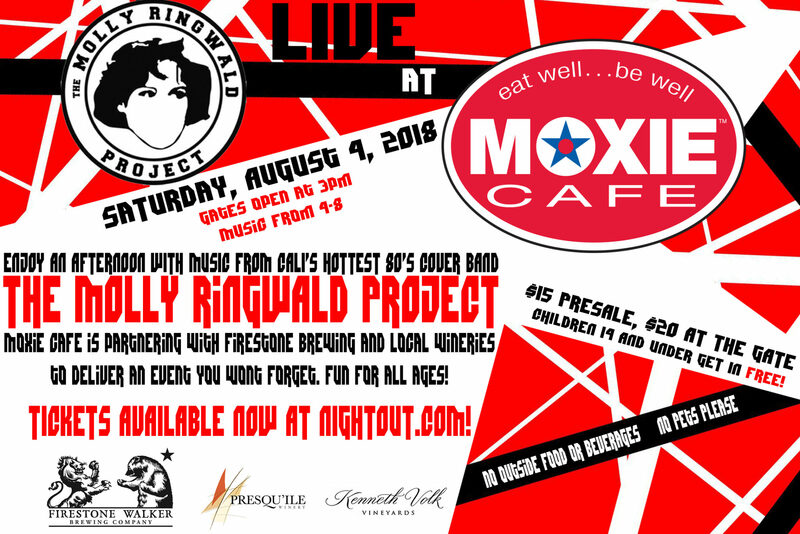 Since 2012 the Molly Ringwald Project has taken the central coast music scene by storm! TMRP plays fun and danceable 80's era songs in one of the highest energy shows you will ever see. MOXIE Cafe is proud to be hosting this event to kick off their concert series in their newly developed outdoor venue! This is an outdoor event for all ages. Free admittance for kids age 14 and under, and fun and games provided for the young ones. MOXIE Cafe is partnering with Firestone Brewery, local wineries Presquille and Kenneth Volk to provide delicious food and beverages at the concert. Bring out your lawn chairs and dancing shoes, and come enjoy a rockin' concert right here in your back yard.